Every rally has its own energy, a particular mood or spirit that propels it along. 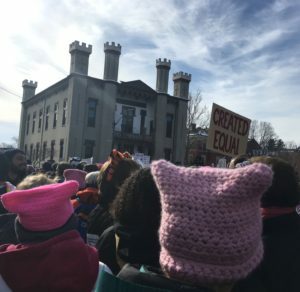 That was the case in Northampton, Massachusetts, when over a thousand women, men and children took to the streets on January 20, the first anniversary of President Trump’s inauguration. The Pioneer Valley Women’s March: Hear Our Voices, Hear Our Vote was a colorful and festive affair that gathered together, in one great flow of collective energy, a multitude of voices and concerns, among them women’s rights, gay and transgender rights, rights of immigrants and rights of the poor, climate justice, racial justice, and economic justice. I am someone who loves words and who delights in other people’s creativity, so I did what I often do at rallies: I pulled a notebook out of my pocket and jotted down some of the signs that caught my eye. Some of them made me laugh. Perhaps they deserve to be set to music or read aloud like a poem. I smiled when I spotted a familiar feminist image: a clenched fist inside a woman’s symbol, and the words, Sisterhood is Powerful. Pinned to my coat was my antique Sisterhood is Powerful button, which I wore back in the late 1960’s and early 70’s. I smiled even more broadly when an updated message rose into view: If your feminism isn’t intersectional, it’s not feminism. 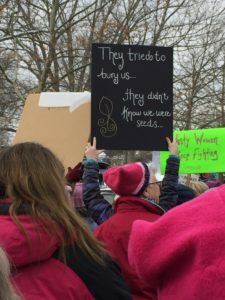 I savored the resilience expressed by one message (They tried to bury us… they didn’t know we were seeds) and the commitment to solidarity expressed by another (All of us or none of us). One sign conveyed the impossibility of listing why a person might want to join the march: So many reasons. Another sign – which made me laugh out loud – expressed dazed incredulity: Not usually a sign guy, but geez. I guess you could say that is one reason I joined the march: I like to breathe. It is literally breathtaking to realize that, day by day, the ocean is losing oxygen. It is enraging, it is baffling when a government decides to open up additional areas of the ocean to drilling for oil and gas, when we know full well that burning oil and gas is starting to throttle the ocean and could eventually suffocate us land creatures, too. Hello? Does anyone see a disconnect here? So I marched, flag in hand, grateful for each breath and glad for a chance to help build momentum and political will for a better future. For me, the most memorable incident of the day took place before the march began. 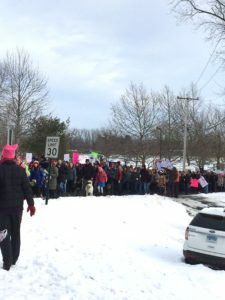 Hundreds of us had converged at a local field and were beginning to line up in the street. 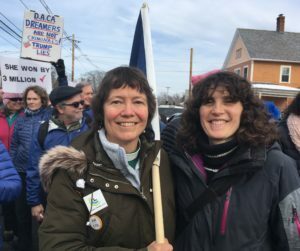 We were trying out chants, greeting friends and strangers, admiring each other’s getup and signs, and feeling the excitement of anticipating a good long march to City Hall. Suddenly the young woman in front of me began to sag. She sank down slowly, like a leaf dropping gently to the forest floor. People cried out in surprise; hands reached out to cushion her fall; and in a moment she was splayed uncomfortably on the asphalt, unconscious, as we straightened her legs and looked around for help. The girl kept sobbing, “I want my mother!” like a mantra, like a prayer, fumbling for her phone, dialing a number and never getting through, as her teenage girl friends stood close by, stricken and wide-eyed. At last her mother answered the phone, and the girl sobbed, “Mom, I lost consciousness! I’m frightened!” She listened for a while to her mother’s voice, and then, slightly calmer, she passed the phone over to me. Her daughter was excitable, her mother said, and easily overwhelmed; this was the first time she’d ever gone to a big event without her parents. Probably she needed simply to be comforted and calmed. So I kept my arm around the girl’s shoulders, kept offering words of reassurance, and eventually she accepted a sip of water, and wiped her nose, and took an Oreo cookie from one of her friends. By now the crowds surrounding us were beginning to move, so when she was calm enough to stand, I walked her to the side of the street. She smiled at me as the medic arrived. “Thank you,” she said. “I’ll pray for you,” I told her, before I stepped back into the flow of the crowd. I hope and trust that she will indeed come back, stronger than ever. I see myself in her. I know what it’s like to feel vulnerable and overwhelmed. I know how much it matters when someone – even if it’s only a stranger in a crowd – offers us help when we need it. I expect that, when the time comes, she will offer her strength to the next person who needs it, for that is how community works: we share what we have and we lift each other up when someone falls. I suppose that’s the whole point of a Women’s March, and of every march that expresses commitment to mutual relationship and solidarity: we intend to show up for each other, to fight for each other, and to keep making the circle larger, until no one is left out. I hope we’ll keep doing that – whether we’re young first-timers or old grandmas like me – for as long as we have breath. That’s the vision I see in that magnificent passage by the prophet Isaiah, who hears God calling for a world in which the oppressed are set free, the hungry are fed, the homeless are housed, and we no longer turn our backs on our own kin (Isaiah 58). Women and men, black and white, land creatures and sea creatures, we are all in this together. Like the sign says: it’s all of us or none of us. This makes my day, Margaret. We couldn’t do anything that day ourselves, so it was nice to attend such a festive gathering vicariously. Great pictures–you’re looking wonderfully upbeat. 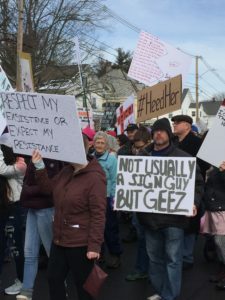 I’ve seen a lot of the signs elsewhere, but of the ones new to me my favorites are Fact Checkers of the World Unite, Time’s Up, Nature Bats Last, So Many Reasons, and Not Usually a Sign Guy But Geez, which is the one I’d have carried had I been there. I love that you compiled that list. And thanks for your story about the young woman who fainted. A perfect little epiphany. At this point in my life passing the torch seems almost like the most important thing, since we don’t know what’s in store for us and none of us really have the answers. Those who succeed us will just have to figure it out. Thank you, Dan, for your ongoing support and encouragement. Yes, we try to keep that torch alight and to pass it on to as many hands as we can! Thank you for your dedication and commitment over the years. I am so glad you are still here, Elinor, fighting the good fight and bearing witness to what you love! Thank you for your long-time advocacy for peace and justice. Yes, let’s help each other to shake off depression and paralysis and to keep our eyes on God’s realm of justice, peace, and mercy. Through the power of God’s Spirit working through us, God can do infinitely more than we can ask or imagine. I was there, at the beginning of the march, shifting from foot to foot, waiting for the police to arrive to clear a path for the march. I wondered how it was that the police thought the march’s start time was 11:30, instead of the 11 o’clock time thousands of us knew. The leaders signs saying “time’s up” were going no where. The delayed start was emblematic of the lack of power we feel now to hold leaders accountable, except by shouting into the ether. I wondered whether the march might propel many marchers to go to the next level, nonviolent direct action, demonstrations that disrupt business as usual? How many will go to the headquarters of the companies involved in offshore drilling? Or the authorizing agencies? How do we convert our collective wishes into insistences? Judy, I am grateful for your sense of impatience and urgency, which I share. 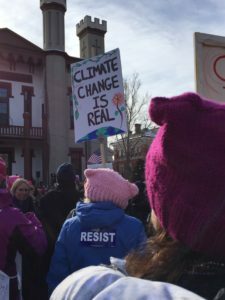 Yes, marches like these can renew our spirits and energy — the next step is to see where we can apply real pressure and influence. Supporting carbon pricing legislation in Mass. is a good possibility — another is working to support the gubernatorial candidacy of a climate champion (thank you for your leadership on that!). 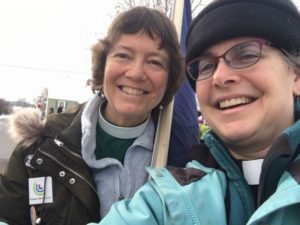 If you’re interested in connecting about plans for prayerful civil disobedience, let’s talk off-line. Beautiful! Thank you for sharing these stories of resistance and courage, Margaret. I think that the young woman who fainted was doing so as a proxy for all of us. We should all be rendered flat on our backs, unconscious, by the enormity of the violence being done in our names and with our funding. That she was crying out for her mother also seems just right; she was registering a crie de coeur on behalf of all of us in these unimaginable times. Thank you for answering her call in the moment, Margaret, and for answering such calls, voiced or silenced, constantly in your life and ministry. Thank you, dear Kerry, for this very sensitive reading of the event of the young girl fainting. Her cry for her mother does indeed resonate with the prayerful cry that many of us are making to our divine Mother, who alone seems able to hold us and guide us in these perilous times. And of course we cry out with and for Mother Earth. I am grateful for your insight into this small but meaningful encounter between a young girl and an older woman. Thanks for reading and responding to my essay, Trish, and thank you (and Tim) for being part of the march. Yes, we are all in this together. May that awareness and energy grow strong among all of us! Hi Margaret. I was out of the country when the march took place. I had gone to last year’s march in D.C. and would have loved to join the Pioneer Vallye march this year. Your summary brought me some of the same comfort I felt last year, knowing that we are not alone. I loved the list of signs, and the story about the seventeen-year-old – how brave she was! And I didn’t know that the ocean was responsible for generating 50% of our oxygen. Thank you for sharing this post with Village Hill! Thank you, Lesley, for reading the post and sharing your responses. Glad to know you’re in the neighborhood and part of this movement to create a more just and gentle world.